Elisabeth Roudinesco and Seuil were convicted of libel by the 17th chamber of the High Court of Paris, in their respective capacities of author and publisher of the book, 'Lacan, against all odds'. This book alleged that in fact the last will of Lacan concerning his funeral was not met: "Although he (Lacan) expressed the wish to end his days in Italy, in Rome or in Venice and would have wished for a Catholic funeral, he was buried without ceremony and in the privacy of the cemetery of Guitrancourt." As a result, Judith Miller, daughter of Jacques Lacan, who took care of his funeral, considered herself defamed. "By its lapidary formulation, its construction and the words used, the sentence: "While (…) he would have wished for a Catholic funeral, he was buried without ceremony and in the privacy of the cemetery Guitrancourt", cannot in any way be interpreted as an expression of "a point of view", or a "hypothesis", even if "reasonable", for showing up a "paradox", a mere "wish attributed to Lacan (…)", a "dream" of "great Catholic funerals" that Jacques Lacan "one day" uttered "with bravado". "This phrase" by its brevity, its composition and the opposition on which it is built between the wish expressed by Jacques Lacan, presented as a certain and objective fact, and the opposing reality of the funeral", meaning that "a wish of Jacques Lacan was not respected by those in charge of organising the funeral." The Court then considered whether the author of the incriminating words would take advantage of her good faith. He has found that in 1993, E. Roudinesco had raised the same question in the following terms: "Lacan was an atheist, though, out of bravado, he had once dreamed of great Catholic funerals." This formulation, said the court, "should not in any way be confused with the statement, as concise and as conclusive, that is subject to these proceedings." Considering the fact that the author "did not have a serious piece of information to support her" on her remarks, the court concluded that "the benefit of good faith cannot be granted to E. Roudinesco." Note on "good faith exception" (from Wikipedia). The exception in good faith entitled in law to the press and publishing houses does not involve proof of the truth of the facts. It is awarded based on four criteria, recalled by the Court of Appeal of Paris in a decision. 4.The quality of the investigation. Reproduction or quotation of defamatory libel may represent a new defamation and be subject to prosecution. 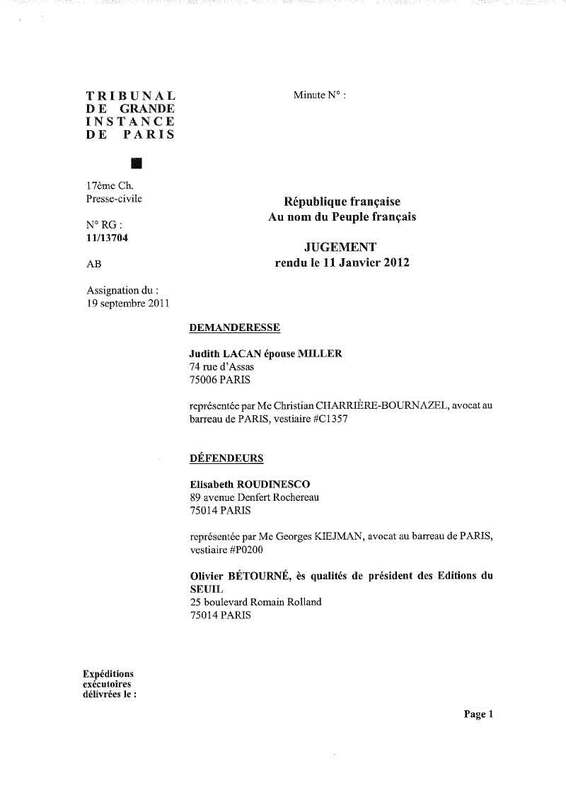 On lira ici le texte du jugement rendu le 11 janvier 2012 par la 17e chambre civile du TGI de Paris, sur la plainte en diffamation déposée par Judith Miller à l'endroit des Éditions du Seuil et d'Élisabeth Roudinesco. Ce jugement est frappé d'appel. Judith Miller tient à remercier publiquement tous ceux qui l'ont accompagnée dans sa démarche, notamment son avocat, Maître Christian Charrière-Bournazel, Le Diable probablement et les 1392 co-signataires de la lettre de LDP.